Triniti is a revolutionary skin rejuvenation system which involves three types of treatments working together to tighten the surface of the skin, eliminate sagging, reduce fine lines and wrinkles, and remedy uneven skin pigmentation. Doctors will perform one type of treatment at each appointment, and these will be scheduled at least two weeks apart to allow healing in between them. 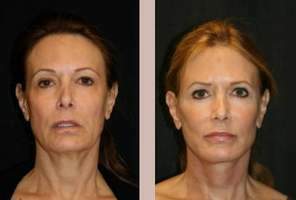 The process combines bi-polar radio frequency and laser energy in a cutting-edge process to soften lines and wrinkles. The first applicator, the FotoFacial RF, raises the skin temperature of the damaged areas so that the laser can target these tissues. The second applicator used by the clinician is the Refirme applicator which activates the fibers of collagen beneath the skin surface, tightening the area immediately. The final applicator is the Matrix IR laser which remodels the collagen in specific areas. What areas of the body does Triniti treat? The Triniti series is used to treat the skin of the face and neck. It can reduce bags under the eyes, tighten jowls, and lift the skin under the brows. What are the advantages of Triniti over other similar treatments? Patients undergoing the Triniti skin rejuvenation process experience almost no pain. Patients report improvement after a single office visit and can return to their daily schedules quickly. In comparison to other treatments which achieve the same results, Triniti is more cost effective and uses less light energy. Who is a candidate for Triniti? Triniti can be performed on males and females who wish to reduce the effects of aging. It is safe and effective on all skin types and ethnicities, but those with heavily tanned or sun-damaged skin may not get the desired results. Also, patients taking photosensitive medications should stop them well before the treatment date. It is wise to discuss all medications with your doctor before beginning this procedure. The clinician will first clean the area to be treated. Then, the patient will be asked to wear goggles to protect the eyes from light. Next, a gel will be applied to the skin surface to cool the skin as the applicator is applied. The patient may feel the skin begin to warm with one applicator and a light pinching sensation with another, but this is rarely painful. The clinician will move the applicators over small patches until he or she has covered the entire surface. Doctors suggest that patients use cool compresses to reduce discoloration and swelling after treatment. Patients recovering from Triniti should also stay out of the sun and away from heat, avoid abrasive cosmetics, and use a sunscreen with a high SPF for a few months. Most patients return to normal activities immediately. Patients should see a remarkable difference in the elasticity of their skin after one treatment. The face will be tighter and brighter with lighter age spots and spider veins. After three sessions, complete rejuvenated results should be evident. Swelling and redness may occur right after treatment and the treatment site may be tender. Is Triniti approved for use in the U.S.? In the U.S., The Food and Drug Administration has cleared Triniti for use in facial rejuvenation treatments. Is Triniti covered by insurance companies? Like most other cosmetic procedures, Triniti is not covered by medical insurance companies. Because the costs range from $1,500 to 2,500 depending on which provider is chosen, patients may find that many are willing to work out a payment plan.